Leg & foot put into plaster – very sore & paining. Food ration not very good. Leg a little easier – sent cables away by Padre. Iti prisoners & Palestine Arabs doing orderly work on wards. Sisters very considerate. Lady Freyberg around visiting NZ soldiers giving us tobacco & writing material. Started writing home. News from front seems good. Doctor fitted false heel onto plaster. Able to get up tomorrow. 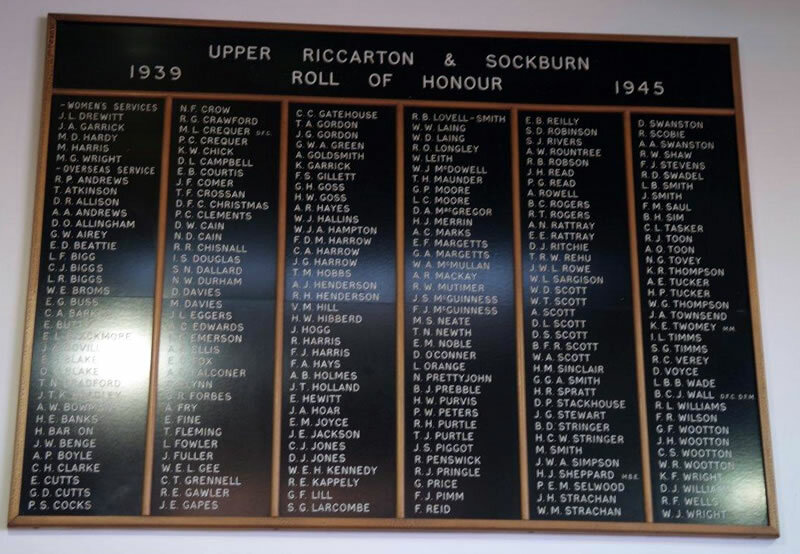 Photo borrowed from http://www.nzhistory.net.nz which shows the names of Wootton family members of Upper Riccarton & Sockburn who served during WW2 including G F Wootton. 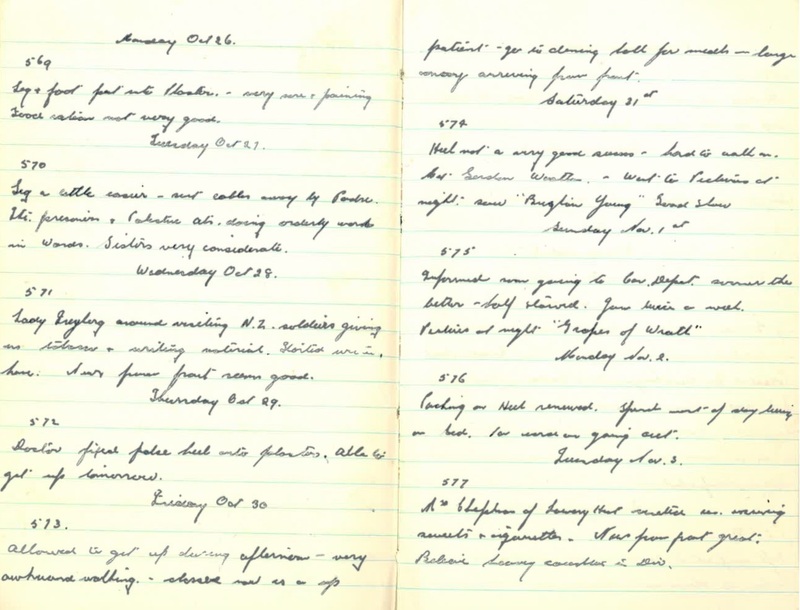 Allowed to get up during afternoon – very awkward walking – classed now as an up patient – go to dining hall for meals – large convoy arriving from front. Heel not a very good success. Hard to walk on. Met Gordon Wootton (I believe he may have been a cousin of my Grandmother). Went to pictures at night saw “Brigham Young”. Good show. Informed soon going to Con. Depot (convalescent depot) sooner the better – half-starved. ??? twice a week. Pictures at night “Grapes of Wrath”. Packing on heel renewed. Spent most of day laying? on bed. No word on going out. Mrs Chapman of Lowry Hut visited us, receiving sweets & cigarettes. News from front great : believe heavy casualties in div. 27/10/1942 A counter-attack by the 21st Panzer-Division to push the attacking British forces back into the German minefields fails, costing them 50 Panzer’s. This leaves the axis forces with just 81 operational tanks. 02/11/1942 Operation ‘Supercharge’, the breakout at El Alamein gets under way. Rommel has only 32 Panzer’s left intact. 03/11/1942 Rejecting out of hand Field Marshal Rommel’s proposal to withdraw the Afrika Korps, now down to about 40 tanks, to the Fuka line, Hitler orders him to stand and fight. Sat 31st Movie was Brigham Young. e was leader of the Mormon church in US Wiki says the movie ,.After the murder of their founder, Joseph Smith (Vincent Price), members of the Mormon Church flee to the West in search of a place to practice their religion in peace. Leading the way is Brigham Young (Dean Jagger), who brings the Mormons to the Great Salt Lake in Utah. Seems a funny movie to show to a lot of soldiers! “Brigham Young” starred Tyrone Power and Linda Darnell was released in 1940 by Twentieth Century Fox Film Corporation. See http://www.imdb.com/title/tt0032281/?ref_=ttco_co_tt. Day 570 — Yes, Italian prisoners and Palestinian Arabs.